Sims Creek is a waterfront community in the heart of Jupiter. The community offers 201 homes comprised of single-family homes, townhomes and condos and was built between 1981 and 1993. Homes range in size from 1,100 to 1,800 square feet and feature two to three bedrooms. This quiet and private community provides amenities such as a community pool, clubhouse and a marina with boat slips. Enjoy easy access to the Loxahatchee River, Intracoastal waterway and the Atlantic Ocean from your own back yard. This hidden gem of a neighborhood is only 5 miles to Jupiter's perfect beaches, 3 miles to I-95 and the Florida Turnpike and close to many dining, shopping and entertainment options. 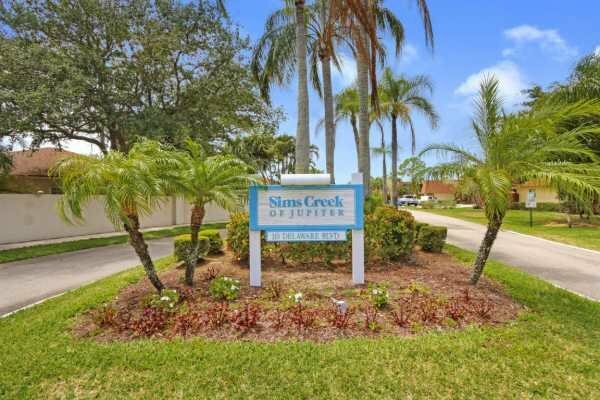 Sims Creek offers low HOA fees and is zoned for A rated schools. Located in the Hidden Gem Neighborhood of Sims Creeks. This 2/2.5 townhouse has updated kitchen with Granite Counter tops and newer cabinets. New A/C,new real wood floors upstairs... Spacious bedrooms. New closet doors in master bedroom. Accordion shutters on second floor sliders. New Fence.